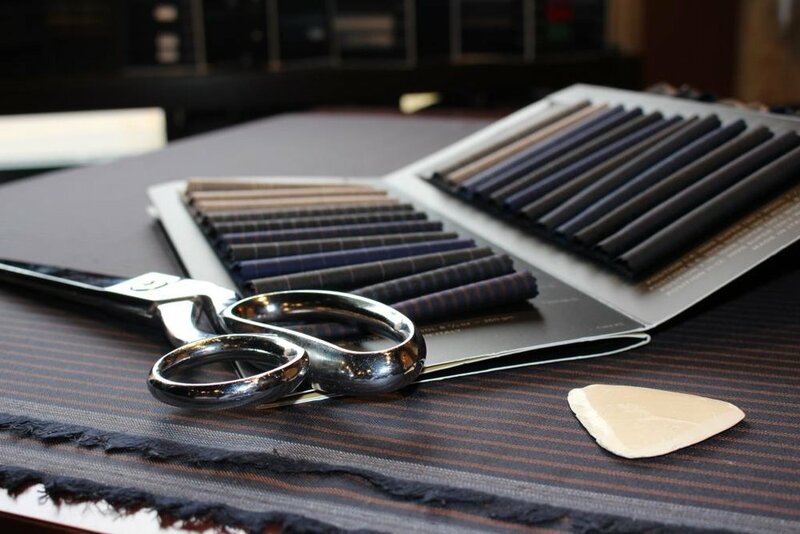 At Savile Row we hold a selection of fabrics that range in price and quality. All of the wools are pure wool, never less than super 100’s and come in a variety of weights. Our first selection is aptly named Individual Tailoring. I call these our perennials, available all year round. We hold stock rolls of these in our work rooms so there is no delay in cutting being able to be started as soon as the measurements are taken or an exclusive pattern is made. I update this collection annually, discounting some cloths and refreshing it with additions of design or colour based on trending styles. Our next selection is Designer’s Choice. This is where I sift through literally hundreds of pattern books from around the world each season and make a selection based on fashion and colour trends. These come from some of the best mills in England, Italy, France and Japan. I carry out this process every six months so there is always something new and exciting to be found. The final selection is from the dozens of Merchant Books we carry from some of the finest mills in Europe. A wide variety of design, quality and price. I have already made my selection above from these bunches, as they are called, but we carry them for your pleasure in case I’ve missed something. In addition we carry specific bunches of specialist fabric in linen, cotton and even bamboo for more exotic tastes. It must be noted that from designers choice and the specialist bunches there may be a slight delay if the chosen fabric has to be imported. Our tailors will always make the call to the appropriate merchant at the measuring stage to ensure the chosen fabric is immediately available. Jeff and his tailors will guide you through all the choices you can make in building your suit. Here he talks about how it works.